It might surprise you to learn that level of educational attainment doesn’t make a huge difference, in terms of who asks for a raise. Holders of bachelor’s, master’s, MBAs, and JDs all have the same rate of negotiating salary: 43 percent. 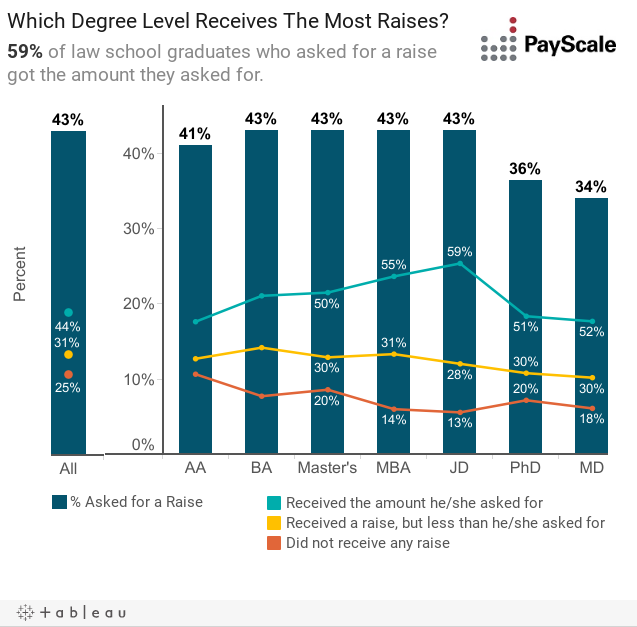 The difference comes in when we look at who actually gets what they ask for — and in that category, the lawyers have it over everyone else, with a whopping 59 percent saying they got the raise they wanted. So what are lawyers doing, that the rest of us are not? In short, attorneys have an advantage, because the very nature of their job requires them to become negotiating pros. If you want to duplicate their success, you don’t need to go to law school — you just need to learn how to build a case the way lawyers do. Even if they aren’t going to court, lawyers enter every negotiation with evidence in hand. Law is based on evidence and precedence, so lawyers never walk into court without investigating all the facts and a history of what happened in similar cases throughout history. Even if they’re operating in an advisory capacity (for example, helping you set up a trust, rather than helping you win a lawsuit), a good lawyer walks into every negotiation with every an answer to every imaginable question. Research is at the core of what lawyers do. To build your case for a raise, start out by gathering facts. PayScale’s Salary Survey can help you determine what you should be making, based on your education, experience, skills, industry, and geographic location, among other factors. It’s not enough to know what people in your field and with your job title are earning — you need to be able to prove that you rank with the best of them. Attention to detail is your friend, and in this, once again, you can learn from lawyers. Building a case requires logging the facts in a way that is easy to recall and present in an organized fashion, when needed. Get in the habit of keeping track of your successes, and documenting their results. Bonus points if you can demonstrate that something you’ve done saved or earned the company money, but in any case, the point is to present facts, not emotions, in as clinical a manner as possible. Jurors aren’t going to listen to a jittery attorney, so when you’re presenting your case, confidence is key. Only 15 percent of JDs who did not ask for a raise did so because they were uncomfortable asking for more money. Perhaps this is the best lesson of all: ask for what you deserve, and try to stay out of your own way. Once you’ve done your research and demonstrated that you’re worthy of the money your experience, skills, and accomplishments deserve, go forth without fear.